Hello, my name is Heather Ellis and I am 10, from Yorkshire in England. Nice to meet everyone! I released my third children’s book in December 2013. With help, I got it released on Amazon – I thought that people on KidsBlogClub would be interested in how you go from having your book idea to getting it up on sale on Amazon. 3) Lots of patience, I will explain later. 4) Someone good at English to proof read your book. I started writing in 2010. My mum was out that day shopping with her girly friends and I was at home with my dad. I was bored that day because my best friend was away on holiday. To stop being so bored, I got a piece of paper from the printer and started writing a story mountain and then typed it up a story on the computer. My dad was looking after me at home. I showed him my short story (which eventually became “The Sugary-Sherburts”) and he loved it. When my mum and her friends came back from shopping I gathered them around me and read my story from start to finish. They all clapped and told me what a wonderful story it was for someone my age. A couple of days after that – when I was bored again! – I sat down with my dad and started drawing (we sometimes do this because my dad is awesome at drawing). 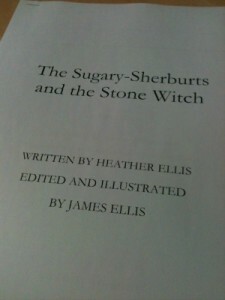 He did some drawings for ‘The Sugary-Sherburts’ and scanned them into the Word document story I created. All of a sudden, my dad told me that he had been reading about this web-site called CreateSpace (which is joined with Amazon.com) and that I should look at trying to get itself published on Amazon for people to buy. Self publishing is where you don’t have a company working on your books, you do everything yourself to get it online for sale. You upload your book to CreateSpace and publish it on Amazon! Amazing! I thought that it was a great idea. Three months later my book was online and for sale. Although I would say of all my books the average is about 4 months to release a book. 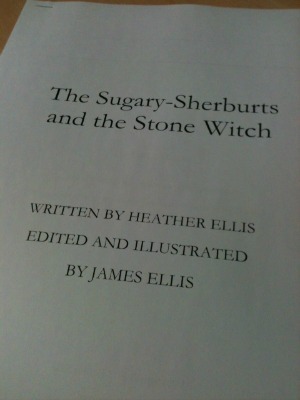 My third (and latest) book was a sequel to ‘The Sugary-Sherburts’. 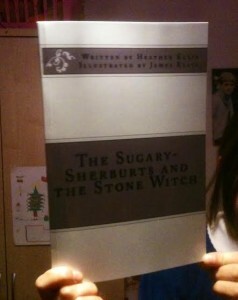 It’s called ‘The Sugary-Sherburts and The Stone Witch’, I wrote it because my first book was very popular and people said it could be a good series. Writing the story is the easy part though. There is lots of work to do afterwards. My dad edits my books. He will print out the book and go through it, highlighting parts that need explaining more, or where the punctuation or grammar isn’t right and he will sit down with me and go through it. It takes a long time to do this, because I have to make changes each time. Every time you think it is finished you find more problems with your book. Eventually you will get a full completed proof – at that point we print it off and give it to my mum (who is an English teacher). My mum marks books for a living, so she is good at looking at my books with fresh eyes (she never gets involved in the story until that point). She will tell us what she thinks and find any problems with the writing, spelling and grammar that me and my dad have missed. Then we edit again etc. I know when my story is ready to publish because I have read soooo many times that I don’t want to read it any more. Also, my parents both read it so many times and cannot find any more errors in it. That’s when it is usually complete and ready to upload. When the book is finally finished, it needs to be at least 25 pages to go onto CreateSpace. My dad uploads it for me (I am not old enough to have an account) and he sets it up so that I have a print and a Kindle copy. It’s a bit technical for me also, you need someone who is confident with the internet and has a technical brain. Do you want to write a kid’s book? Just remember to save and backup your work regularly – I was writing The Stone Witch and my mum’s computer broke and I lost it. I had to start again and that was very annoying. Thank you for reading – good luck! Thank you for this post. I have a 9 year old daughter who writes very well, but can’t stand any kind of criticism on her writing. I’m going to get her to read this when she comes in from school – she might just be inspired! What a lovely post and well done to you – great things ahead no doubt. Wow! I love writing but don’t have the patience to write a book. 🙂 this is good article! Thanks for sharing this! This was so helpful for my 8 year old daughter! Thank you! What a clever girl! Such an interesting article, Heather! Will definitely have my 11-year-old read it!